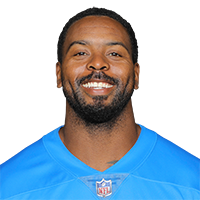 Published: Sept. 10, 2017 at 01:20 p.m.
Detroit Lions safety Tavon Wilson intercepts Arizona Cardinals quarterback Carson Palmer. Published: Nov. 20, 2016 at 07:17 p.m.
Jacksonville Jaguars Qb Blake Bortles intercepted by Detroit Lions safety Tavon Wilson. Published: Nov. 20, 2016 at 01:55 p.m.
Jacksonville Jaguars running back Chris Ivory fumbles, Detroit Lions linebacker Antwione Williams recovers. Published: Oct. 23, 2016 at 01:36 p.m.
Washington Redskins running back Matt Jones fumbles on the goal line late in the first quarter.